Named after the image of a duck surging up from the water, the duck carafe is the symbol par excellence of an aerating carafe, designed by Peugeot to respect the wine while awakening its aromas. 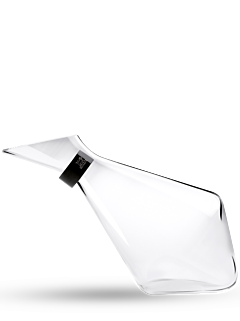 Classic and authentic, the Peugeot duck carafe sits in an inclined position, allowing the wine, which is disturbed in its transfer from the bottle to the decanter, to maintain the position it had when the bottle was lying in the cellar, which prevents sediments from going back into suspension. It is especially suitable for young wines, enabling homogeneous oxygenation for them, since the greatest possible surface area of the wine is in contact with the air. The rich and complex aromas will then be revealed, while letting any reduced notes fade away.